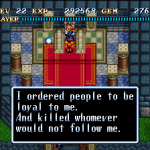 Ever wished that there was a game out there that crossed both the action and town building elements of Actraiser in a top-down action game like Zelda or Illusion of Gaia? 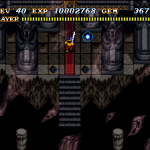 If you missed it, your wish was granted back in 1992 with the release of “Soul Blazer” by Enix for the Super Nintendo. Published by Enix, Quintet was actually the company that developed it, the same people behind Actraiser. 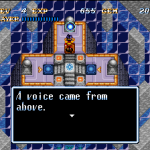 Given the similarities between the two, many people think of Soul Blazer as the true “Actraiser 2”. 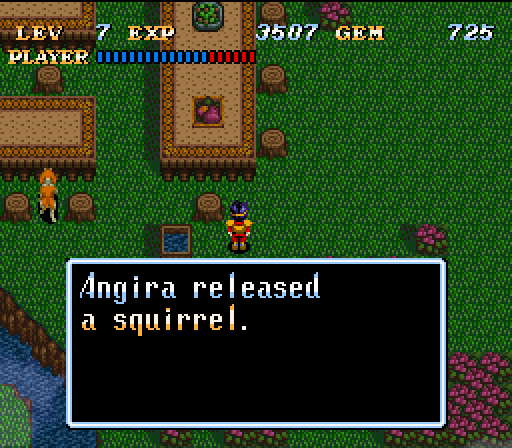 Where Actraiser was half side-scroller, half city-builder, Soul Blazer blends these 2 elements much more directly into one top-down Zelda-esque action RPG platform. 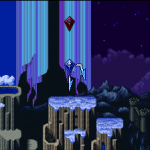 The gameplay is quite similar in style to Zelda or Crystalis (top-down action) with a semi-grid style map (finer than “full square”, it’s more like “1/4 square”). It certainly leans towards more RPG elements however, as interaction with others and the story is somewhat important to the game’s progression. The story isn’t nearly of Final Fantasy uberness or depth, but is a little stripped down, easily understandable, and adds a nice touch and mood. In this game, all living creatures in the world have been imprisoned by the demonlord Deathtoll, and you are an angel in human form sent by “The Master” (God, Gaia most likely) to release all creatures, large and small, from his clutches. You have the power to communicate with all living creatures, which is good because you will have to free not only humans, but all manner of woodland critters, sea critters, plants, and even sentient machines! You do this by journeying into dungeons (and in some cases dreams, paintings, models, machines, etc.) 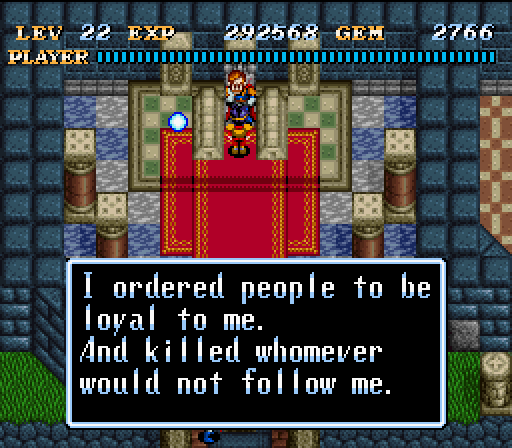 and defeating enemies and sealing their “Lairs” (Hello, Actraiser!). You must destroy the enemies that each Lair spawns, and when it runs out, you can step on it to seal it. Each Lair you seal (there are a lot of them!) will release a resident of the town near whichever area you are freeing, and will spontaneously rebuild parts of the town as well. In this way, you rebuild the world, and as you do, the residents will reward you with advice, gear, or insight into how everything fell apart. There are many points where the only way to advance in the dungeon is to free a specific individual to help you, so frequent trips between town and dungeon are a good idea. When you clear an entire area (with a few exceptions) you will then be able to move on to another part of the world that needs your help. 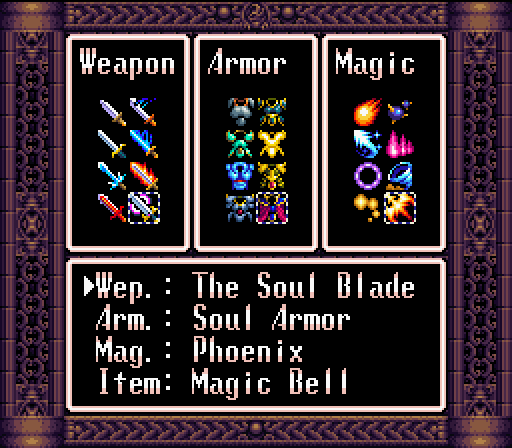 Throughout the game, you acquire new swords, armors, spells (8 of each), and a variety of unique items to use in battle or to progress. You’ll need them all, since many enemies are only effected by certain attacks, different armors help you survive different conditions/enemies, and most spells, even the early ones, are useful throughout the entire game in different situations. 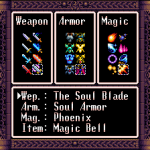 You can only have one weapon, one armor, and one spell equipped at a time though, as well as one of the many extra items, so you must pick carefully depending on your needs. You are also accompanied by a Soul Orb that is the focal point for several Angel spirits that will help you throughout your journey, showing you invisible enemies, secret passages, lighting up the darkness, etc. This Soul Orb is also where most of your spells are actually cast from. When cast, the spell launches from the Orb in the direction you are facing, which gives an interesting tactical approach to magic. To use a spell, you must have enough “Gems” to cast it. Gems drop from enemies, but in limited amounts, so you can’t just spam spells at everything, and you may need to save them up to kill certain enemies and bosses. 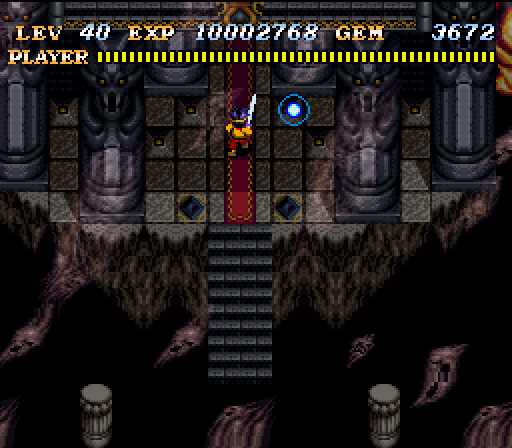 As you hoard Gems throughout the game, you can save up enough to use spells quite frequently later in the game, which is nice. 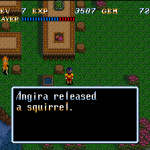 If the gameplay reminds you a little bit of Illusion of Gaia, that is no accident. 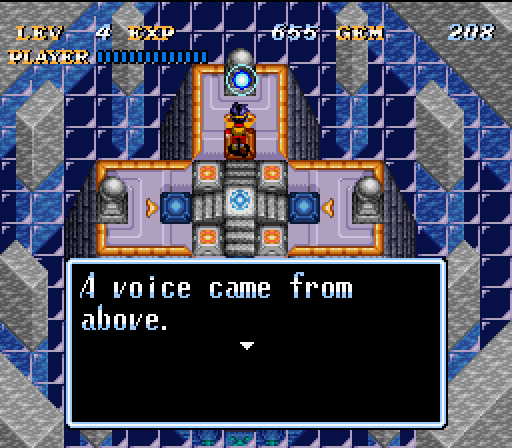 Soul Blazer is the first installment of a very loose trilogy of games, Illusion of Gaia being the second, and Terranigma (a game that unfortunately never arrived in the US, and hopefully the subject of an upcoming article) being the third. The play style and themes are relatively similar amongst all three games, but with IoG being almost exclusively action oriented. As I said above, some people include Actraiser in this, but there are no solid links between the games, so it’s up to interpretation. 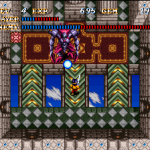 I can really feel the heritage from Actraiser in the themes, story, graphics, and more though. 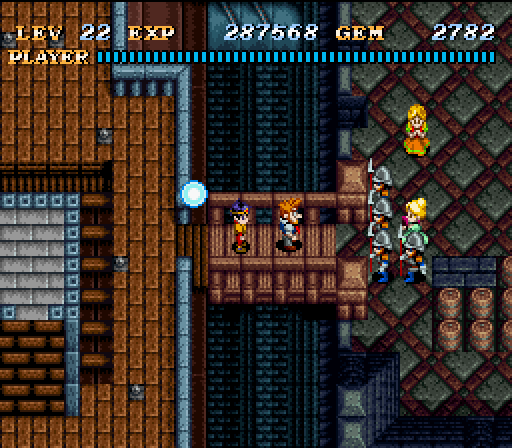 I just discovered that the Playstation game “The Granstream Saga” was also created by many of the same Quintet people working under a different name, with the intention of it being a spiritual sequel to Terranigma! I’m gonna have to check that out! 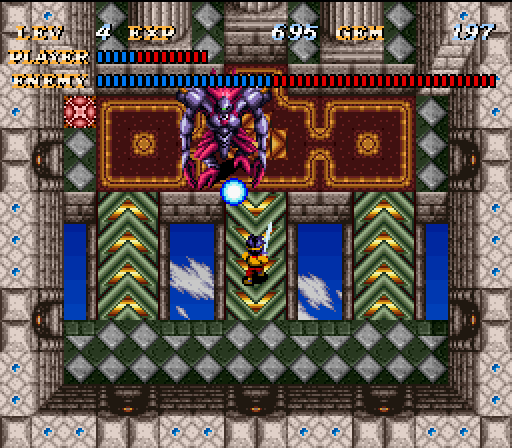 In addition, Soul Blazer also feels like quite a gameplay/character system successor to Crystalis in the main action aspect and the equipment system. 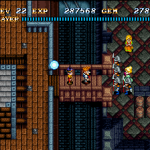 Overall, a very fun game for fans of Crystalis, Legend of Zelda: A Link to the Past, Actraiser, Illusion of Gaia, etc. The raw action element itself may feel *slightly* slower-paced in some regards, but not by much (and not always! ), and is well made up for by the fact you make real progress rather quickly and consistently. On a first play through, the game can take many partial days to complete, but once you’re a pro at it and know everything, it could probably be beaten in a good day or two. There isn’t much grinding needed (or to be done) and progress is pretty smooth, keeping things challenging throughout, but not frustrating. Most bosses are more a matter of strategy than raw survival-of-the-fittest hack’n’slash, You’re not going to be bogged down for 40 hours of grinding/training to be uber-pro with this game, and is a good pickup for a short-medium romp through an action RPG!